EveryPig Release Notes is our periodical update that highlights recent product enhancements we’ve made so you can easily stay up-to-date on what’s new. 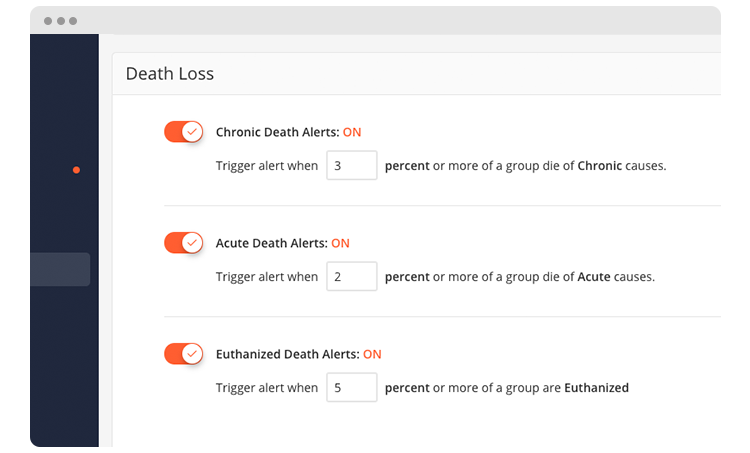 Now trigger death loss alerts based on a percentage. Manage Death Loss from the Admin panel under "Health Variables” tab. Now you can set EveryPig to trigger death loss events based on the percent of pigs lost in a group. Switch from an absolute number trigger to a percentage trigger on the Death Loss screen found in the Admin Panel. Note: An Admin role is required to access the Admin Panel. Users can now mention other users in Daily Checkup Notes sections. When a user is mentioned they will receive mention notifications based on their personal preferences. Note: you can update your messaging preferences by visiting the "my profile" screen and clicking on the "Messaging" tab. Older PostJanuary Release Notes: Resources are Here!